Northern Territory continues to climb the affordability ladder, providing untapped opportunities for those willing to step outside of the box. 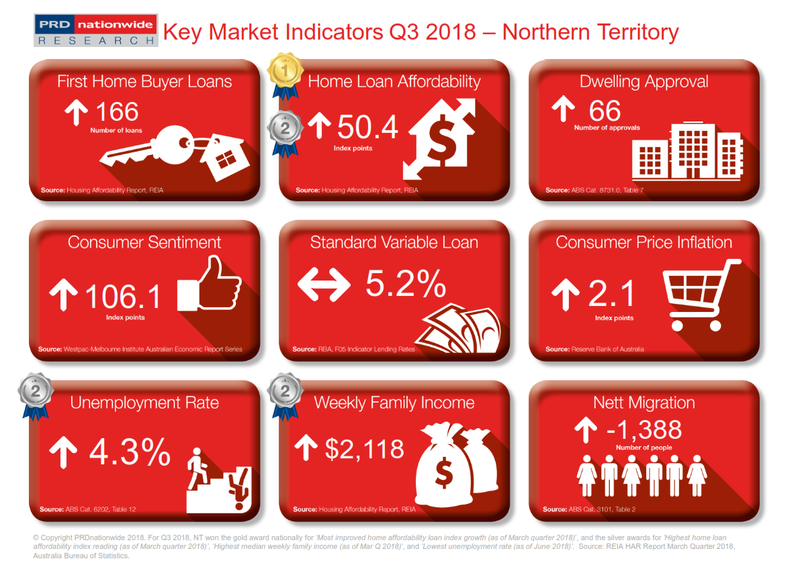 The Northern Territory (NT) takes out the gold award nationally for most improved home loan affordability index growth two quarters in a row, recording a 6.3% growth over the past 12 months to March 2018. With a home loan affordability index reading of 47.4 points the NT takes out the silver award nationally in this category, a reading that is significantly higher than the Australian average of 31.9 index points. The NT has proven to have a friendlier property market to first home buyers, with the number of first home buyer loans increasing by 29.7% over the past 12 months to March quarter 2018. This is slightly above the Australian average (28.0%) and significantly above Queensland (5.0%), South Australia (7.5%), Western Australia (0.5%), and Tasmania (6.9%). Although the NT may not be the most obvious choice for interstate migration, there are untapped opportunities within the state. Unemployment rate in the NT is the second lowest in the country, at 4.3%, much lower than the Australian average of 5.4% in June 2018. Furthermore, the NT has again taken out the silver award nationally for the highest median weekly family income, recording $2,118 in March quarter 2018. This is a slight increase from the recorded $2,113 in December quarter 2017. Thus there is higher chance of employment and/or a healthier household income in the NT. The NT economy is at an interesting cross-road, coming off the mining boom and transitioning to a service and tourism driven economy. The above three key market indicators: unemployment rate, median weekly family income, and home loan affordability; suggests there are untapped employment and home ownership opportunities for those willing to step outside the box and take a chance.